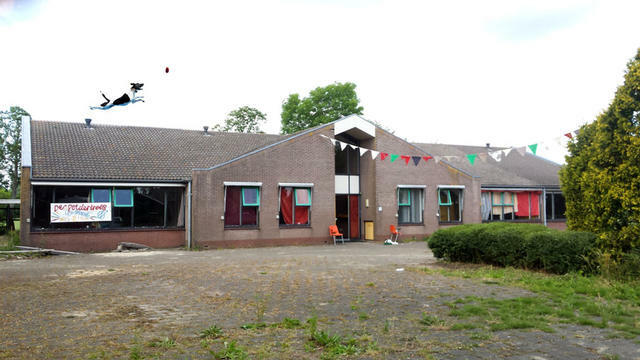 A school building that has been empty for 7 years was squatted in Waverveen, Netherlands. On Sunday June 4th a convoy arrived into the green village of Waverveen to squat a small school, on the Botsholsedwarsweg 13A. Owned by the Gemeente de Ronde Venen, the school named ‘Poldertrots’ has been empty for 7 years. The cops have been and gone after some mild confusion, so we will wait for the arrival of more authorities or Geemente representatives. The Neighbours were all quite OK after receiving a nice letter from the squatters, the kids have been quick to infest the front yard with go-karts and bikes, the sun is shining. The Neighbours have lent us some gardening tools to fix things up, one of the local kids is helping by driving his pedal tractor filled full of trash. Sun is still there. Open day announced on Saturday June 10th. The kids from the hood are already having fun skating around in the sports hall. The neighbours seem quite happy to to see something happening with the school, including the gardening. The sun was shining. A few newspapers have come by today. The Geemente have stated that the process is now with the police. So far that’s it, the sun has been shining but now it’s raining, just a little bit, its still shining somewhere I guess. Next post: Corbyn and the #UK Election; A New Day For Electoralism?